Jesus taught that people need a genuine change of heart to solve their problems. Only then will they recognize those things that are truly important in life. One day Jesus was surrounded by tax collectors and sinners. They were genuinely listening to what He had to say, unlike the pious scribes and Pharisees nearby, who were muttering to themselves about Jesus even talking to such people. It was an appropriate time for Jesus to point out that His work was to speak with those who needed His spiritual help, not those who thought they didn’t. So He told three stories to make His point. The stories have certain common elements: all concern something that has been lost and is now found, and over which there is rejoicing as a result; and all focus on a deep change of heart, a repentance that is meaningful. The first parable was about seeking out a lost sheep. Shepherds will leave 99 safe sheep and go out after one that is lost. This was Jesus’ analogy of what He does when He seeks out the one person who needs His help. He is willing to work very hard for the person in trouble to bring him or her to wholeness. When that one lost sheep is found, there is much happiness. In this way Jesus, telling the story with the religious leaders present, justified His approach to humanity. His conclusion was, “I say to you that likewise there will be more joy in heaven over one sinner who repents than over ninety-nine just persons who need no repentance” (Luke 15:7, New King James Version). Next He spoke about a woman who lost one of 10 silver coins. She looked diligently until she found it. When it was found, she was so happy that she invited her neighbors over to celebrate. Making the same point as before, Jesus said, “Likewise, I say to you, there is joy in the presence of the angels of God over one sinner who repents” (verse 10, NKJV). The third story is a more complex one, but the point is the same. A wise man had two sons, one of whom asked for his inheritance early. The father gave it, and the son squandered it on wild living. He hit rock bottom when finally he had nothing left and took a job looking after pigs. He was so hungry that he even considered eating the pigs’ food. The young man came to his senses and realized that he should go home repentant and ask for his father’s forgiveness. He said to himself, “I will set out and go back to my father and say to him: Father, I have sinned against heaven and against you. I am no longer worthy to be called your son; make me like one of your hired men” (verses 18–19). 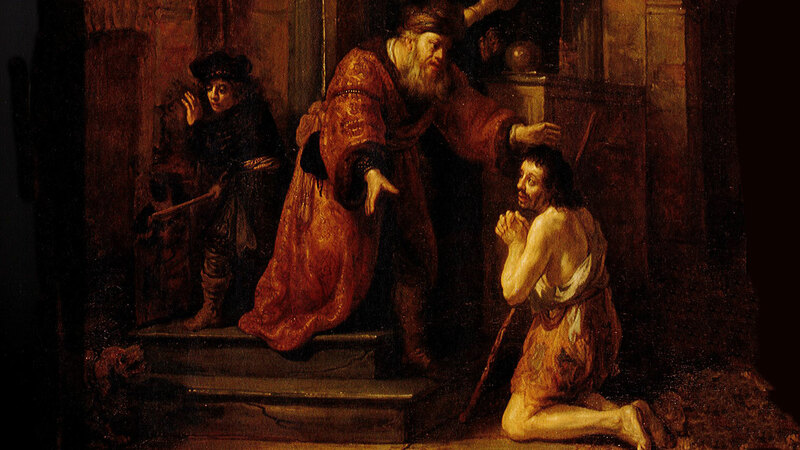 In this parable the son is clearly repentant. This is a model of how we in a repentant spirit should approach our heavenly Father. In the story, while the son was still a long way off, the father saw him coming. He was filled with compassion for him, ran to his son, threw his arms around him and kissed him. The son apologized to his father. The father’s response was to bring the best clothes and put a ring on his finger and sandals on his feet. That night there was a banquet in the son’s honor. The father was celebrating what had been lost and was now found. We can see from these three examples of things lost—the sheep, the coin and the son—that God the Father is always ready to forgive and restore when we repent and change our ways. In an effort to bring the lesson home to the scribes and the Pharisees, Jesus added an account of the older brother’s reaction to the return of the repentant son. He was jealous and angry and refused to go in to the banquet. He was unwilling to accept his brother’s repentant return. His father said to him, “My son, you are always with me, and everything I have is yours. But we had to celebrate and be glad, because this brother of yours was dead and is alive again; he was lost and is found” (verses 31–32). Like the resentful elder brother, the scribes and the Pharisees were not willing that the tax collectors and sinners who surrounded Jesus should repent. In these three stories Jesus drew a striking contrast between repentant sinners and self-righteous hypocrites. This story of the young man who wasted all of his inheritance, known popularly as the Prodigal Son, led Jesus into more teaching about the right use of money. He said: “There was a certain rich man who had a steward, and an accusation was brought to him that this man was wasting his goods. So he called him and said to him, ‘What is this I hear about you? Give an account of your stewardship, for you can no longer be steward’” (Luke 16:1–2, NKJV). This caused the steward, or manager, to worry about his own financial future. He shrewdly decided to call on his master’s debtors and negotiate a reduction in what they owed. When the payments came in, the master commended the wily manager, because his self-interest had produced a good result. Jesus said: “The people of this world are more shrewd in dealing with their own kind than are the people of the light” (verse 8). He was commending the wise use of material possessions to provide for the future, not the underlying craftiness of the steward. Money can be used as a blessing for others. Jesus said: “Use worldly wealth to gain friends for yourselves, so that when it is gone, you will be welcomed into eternal dwellings” (verse 9). There is a wise and godly use of money. It can be used to teach about the kingdom of God, so that when the day comes when such currency is no longer the medium of exchange, it will have been put to good use. People who prove that they can be trusted with a little can also be trusted with much. In the same way, whoever is dishonest with very little will be dishonest with much. Jesus went on to explain something else about material possessions. People who prove that they can be trusted with a little can also be trusted with much. In the same way, whoever is dishonest with very little will be dishonest with much. If we can’t be trusted with dealing with this world’s wealth, how can we be trusted with true spiritual riches? Jesus emphasized that we cannot serve two masters. We have to get physical wealth into perspective. It is not the most important thing in the world. As Jesus said, you cannot serve both God and money. Some of the Pharisees, who were lovers of money, sneered when they heard this. Jesus said to them, “God knows your hearts” (verse 15). He explained that their wealth should not be thought of as a blessing for their keeping the law, because in fact they did not keep the law properly. Giving an example from the society of the time, Jesus said, “Whoever divorces his wife and marries another commits adultery; and whoever marries her who is divorced from her husband commits adultery” (verse 18, NKJV). His point was that the Pharisees were not to misapply the law, including that portion governing marriage. He continued with a story about a rich man who dressed well and ate well every day. Outside his gate sat a beggar named Lazarus, who longed to eat whatever fell from the rich man’s table. Eventually the beggar died, and in the parable angels carried him away to be with Abraham. The rich man also died and was buried. Pictured in torment, and seeing Abraham and Lazarus far off, the rich man begged for their help. Abraham’s reply was, “Son, remember that in your lifetime you received your good things, and likewise Lazarus evil things; but now he is comforted and you are tormented. And besides all this, between us and you there is a great gulf fixed, so that those who want to pass from here to you cannot, nor can those from there pass to us” (verses 25–26, NKJV). The rich man then begged Abraham to send Lazarus to his brothers to warn them of what had happened to him. Abraham said, “Let them rather listen to Moses and the prophets to gain understanding about the right use of wealth.” The rich man replied, “But if someone from the dead goes to them they will repent.” Abraham said, “If they will not listen to Moses and the prophets, someone returning from the dead will not convince them” (verses 29–31, paraphrased). In these examples about the right use of riches, Jesus taught that we should use money wisely and also with compassion for the less fortunate. Jesus would often teach His disciples privately about what they should do after He was no longer with them. On one occasion He rehearsed four important principles about sin, forgiveness, faith and the need to do more than is required. First He said, “Things that cause people to sin are bound to come, but woe to that person through whom they come” (Luke 17:1). He said it would be better to have a heavy stone hung around our neck and be thrown into the sea than to cause offense to one of His people by our sins. Next He gave advice about a brother who sins. He said we should point it out and forgive if our brother changes. We are to forgive as many times in a day as our brother repents. There is no limit on forgiveness in this sense. Knowing their own weaknesses, the disciples then asked Jesus to increase their faith. He replied, “If you have faith as a mustard seed, you can say to this mulberry tree, ‘Be pulled up by the roots and be planted in the sea,’ and it would obey you” (verse 6, NKJV)—the point being that even a tiny amount of true faith can accomplish the miraculous. Finally, Jesus related a parable to teach the principle of going over and above what is expected of us. He said that a man does not thank his employee for doing what he has been hired to do. So our approach to following His way of life should be to say, “We are unworthy servants; we have only done our duty” (verse 10). By this He meant that we should go over and above and beyond what is expected of us in doing what is right. One day Jesus heard news that His friend Lazarus was very ill. Lazarus was the brother of two of Jesus’ followers, Mary and Martha. Despite hearing of His friend’s serious illness, however, Jesus waited two more days before going back to Judea. His disciples tried to warn Him of the danger of going to a place where the Jews had recently tried to stone Him. Jesus’ response was that He could not be deterred by danger, and He knew that Lazarus’s illness was for a great purpose. Jesus told His disciples, “Lazarus is dead,” preparing them for the miracle that was about to take place. When He arrived in Bethany, about two miles from Jerusalem, He found that Lazarus had been in his tomb for four days. His sister Martha came out to meet Jesus and said, “If you had been here, my brother would not have died” (John 11:21). Martha responded that she knew that he would be in the resurrection at the last day. Jesus then taught her that He is closely connected with the resurrection and eternal life. He said, “He who believes in me will live, even though he dies” (verse 25). Martha said she understood and believed that, and went back and called her sister, Mary, telling her, “The Teacher is here and is asking for you.” Mary got up quickly and left the house, along with those who were comforting her. Jesus was moved when He saw the depth of their sorrow and asked where Lazarus’s body was laid. Now Jesus Himself was weeping. There has been speculation as to why Jesus wept, since He knew He was about to perform a miracle and raise Lazarus from the dead. Some have suggested that rather than sorrow over his death, it was sorrow tinged with anger at their lack of faith. Some of them said, “Could not he who opened the eyes of the blind man have kept this man from dying?” (verse 37). Jesus now came to the tomb, which was a cave with a stone across the entrance. “Take away the stone,” He said. Martha protested, “But, Lord, by this time there is a bad odor, for he has been there four days” (verse 39). They took away the stone and Jesus prayed for the benefit of the people standing there, so that they could have faith in Him and believe that God had sent Him. Then He said in a loud voice, “Lazarus, come out!” (verse 43). The dead man came out with his hands and feet wrapped with linen and a cloth around his face—typical of the way people were buried in those days. Some of the people who saw what Jesus did were convinced of His messiahship. Others went to the Pharisees and told them what had happened. The chief priests and the Pharisees called a meeting of their council, the Sanhedrin. They said, “What are we accomplishing? Here is this man performing many miraculous signs. If we let Him go on like this, everyone will believe in Him, and then the Romans will come and take away both our place and our nation” (verses 47–48). The high priest, Caiaphas, then prophesied that Jesus would die for the Jewish people and for the world. The other religious leaders obviously took the high priest seriously, because as John’s Gospel says, “from that day on they plotted to take his life” (verse 53). Aware of this, Jesus no longer moved publicly among the Jews. He went instead to a place near the Jordan valley, called Ephraim, and stayed there for a while with His disciples. Soon Jesus would begin the last journey of His life to Jerusalem.